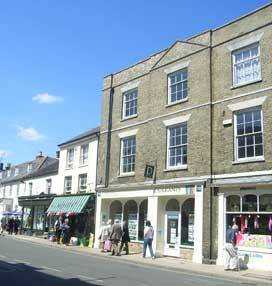 Nos 98 and 100 constitute one Grade II Listed architectural entity which was built in about 1835. James Maggs records that a public house, 'The Two Brewers', previously stood on this site and its landlord from 1814 was James Martin who moved to the Red Lion on South Green in 1820. James was succeeded at the 'Two Brewers' by Robert Barber and, ten years later, in 1830, by John Crowford. Crowford moved to take over the King's Head in 1834 and the pub was promptly demolished by one James Robinson. It is not clear whether JR was already the freeholder or purchased it at the time. Either way, he proceeded to build himself the present building on the site. He died in 1836 and, three years later his widow had a plan to turn the house back into a pub and applied for an Excise Licence. There was a public outcry; 180 householders presented magistrates with a petition of opposition and the application was turned down. 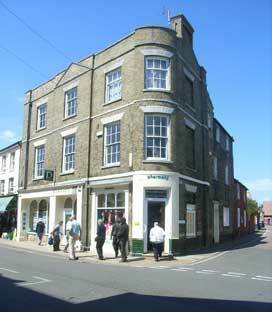 James Robinson whose home was the building which is now Lloyds Bank, (No 17 Market Place) was one of Southwold's leading public figures with a reputation for ostentatious altruism and hosting lavish public fetes. However, he was by no means universally liked and there was a bitter political feud between him and Robert May of No 65 High Street (The Manor House). By the 1871 Census this was the home of the owner of the Sole Bay Brewery, Samuel Haiden Fitch, his wife, Mary and daughters, Fanny and Margaret.(C1871). We are grateful to forum contributor 'robtlb' for sharing his research. See comment below. Note: Until the late 1970s / early 80s, the ground floor of No 98 was divided into two retail units - 98a and 98b - one a tailor's, the other an auctioneer and estate agent. Herbert Adair Adnams - Auctioneer (K1908) occupy the other half of No 98. Nibby Noller - Tailor (Dates required). Nibby's wife, Isobel, runs 'Isobel Hairdressing' at No 39 High Street. Nibby Noller - Tailor. In late 70s or early 80s, H A Adnams takes over both halves of the premises. Durrants - Estate Agents, Letting Agents and Auctioneers. Durrants acquires H A Adnams towards the end of this year and the sale is ratified in January 2007. The whole building with No 100 in the foreground on the corner with Church Street. 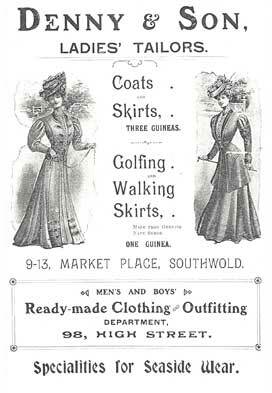 1929 advertisement for H A Adnams in Southwold Wesleyan Church Guide.